It was only two weeks ago that we predicted the day would come when people would be wearing Google Glass in cinemas and be able to record an entire movie. That future has already arrived sooner than we expected. I went to AMC (Easton Mall, Columbus, OH) to watch a movie with my wife (non- Google Glass user). It is the theater we go to every week, so it has probably been the third time I’ve been there wearing Google Glass, and the AMC employees (guy tearing tickets at the entrance, girl at the concession stand) have asked me about Glass in the past and I have told them how awesome Glass is with every occasion. Because I don’t want Glass to distract me during the movie, I turn them off (but since my prescription lenses are on the frame, I still wear them). About an hour into the movie (Jack Ryan: Shadow Recruit), a guy comes near my seat, shoves a badge that had some sort of a shield on it, yanks the Google Glass off my face and says “follow me outside immediately”. It was quite embarrassing and outside of the theater there were about 5-10 cops and mall cops. Since I didn’t catch his name in the dark of the theater, I asked to see his badge again and I asked what was the problem and I asked for my Glass back. The response was “you see all these cops you know we are legit, we are with the ‘federal service’ and you have been caught illegally taping the movie”. He tried to explain that the Google Glass had been turned off and that he needed the prescription glasses to watch the film. This did not seem to impress the officials, who further confiscated his work and personal phones, as well as his wallet. After 20-30 minutes of questioning outside the cinema he was promptly hauled off and taken in for questioning at the mall’s security room. What followed was over an hour of the “feds” telling me I am not under arrest, and that this is a “voluntary interview”, but if I choose not to cooperate bad things may happen to me (is it legal for authorities to threaten people like that?). I kept telling them that Glass has a USB port and not only did I allow them, I actually insist they connect to it and see that there was nothing but personal photos with my wife and my dog on it. I also insisted they look at my phone too and clear things out, but they wanted to talk first. They wanted to know who I am, where I live, where I work, how much I’m making, how many computers I have at home, why am I recording the movie, who am I going to give the recording to, why don’t I just give up the guy up the chain, ’cause they are not interested in me. Over and over and over again. Eventually they brought in a laptop and USB cable, telling the man that this was his final chance to ‘come clean’. After he insisted that he had done nothing wrong, they plugged in the computer, downloaded and went through the photos and five minutes later realized that there was no Jack Ryan recorded on the new fangled device; one which would not have looked out of place in Q’s gadget lab in a James Bond movie. I asked why didn’t they just take those five minutes at the beginning of the interrogation and they just left the room. A guy who claimed his name is Bob Hope (he gave me his business card) came in the room, and said he was with the Movie Association and they have problems with piracy at that specific theater and that specific movie. He gave me two free movie passes “so I can see the movie again”. I asked if they thought my Google Glass was such a big piracy machine, why didn’t they ask me not to wear them in the theater? I would have probably sat five or six rows closer to the screen (as I didn’t have any other pair of prescription glasses with me) and none of this would have happened. All he said was AMC called him, and he called the FBI and “here are two more passes for my troubles”. I would have been fine with “I’m sorry this happened, please accept our apologies”. Four free passes just infuriated me. Interesting to note that digital cinema watermarking on pirated films had obviously flagged up previous instances of piracy, which is why the authorities must have responded as quickly as they did in this instance. And by ‘Movie Association’ does he mean the MPAA? It would seem so. 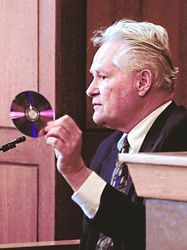 Bob Hope was on the ”Road to Warren” Tuesday when he testified as a trademark counterfeiting expert for the Motion Picture Association of America. This particular Bob Hope, though, happens to be the great-nephew of arguably the best-known comedian and entertainer of all time. Although the trademark Hope ski-slope nose isn’t as pronounced as that of his great-uncle. The Westlake resident and former Ohio Highway Patrol trooper became a loss prevention professional and licensed private investigator. He now works as an anti-piracy field investigator for the MPAA, covering all of Ohio. Apparently this Bob Hope also works undercover for professional sports leagues, where he previously infiltrated the bootleg team logo sports apparel market. The photo shows a certain likeness with his great uncle. This experience doesn’t change the way I wear Glass. I will just have another pair with me when I am going to the movies. In the event somebody else shoves a badge in my face in the future (not in a traffic situation), my plan is to say “lawyer” and then nothing else. If I am in a traffic situation I plan to just be polite, and if the traffic officer decides to give me a ticket for wearing Glass I plan to fight it in court. Not being an outlier and not wearing Google Glass to cinemas while it is still a novelty is probably a good idea, but what happens when Google Glass becomes ubiquitous? It will be easy enough to cover or de-activate the red light that indicates ‘RECORDING’. What then? As we previously said, this is not something that can be easily prevented. So while every effort should be undertaken to deter theft of movies in cinemas, this must be done without alienating the people who still pay good money and make the effort to see films in cinemas. The only fail-proof alternative is to do what the Hollywood studios do at cinema trade shows like CinemaCon, where they preview upcoming films; force people who want to watch the film to hand over their camera phones (and Google Glass), which is put into a plastic bag with a tag and returned at the end of the film, before stepping through a metal detector on the way into the theatre. Given the unpopularity of security screenings at airports and the cost of logistics, we don’t see this happening in your local multiplex any time soon.